I wanted to love this movie for three reasons. First of all, I must admit that even after having seen over 30,000 movies in my life, there are still so many more to see. Japanese director Kon Ichikawa, one of the foremost masters of his country's cinema, is - for example - a filmmaker who inexplicably fell below my radar. I knew he existed, but bad timing forced me to keep missing the handful of massive retrospectives of his work at the Toronto International Film Festival (TIFF) Cinematheque (now housed in the grand TIFF Lightbox complex in Toronto, Canada). I had also been aware of Ichikawa's ongoing obsession with adapting the best of Japan's wealth of great literature and how this generally distinguished him amongst many of his contemporaries. Yasujiro Ozu and Akira Kurosawa were particularly interested in original screenplays - good on them, but I never look a road map in the mouth, so to speak. For me, Japanese literature (save for Yukio Mishima) continues to be an unknown commodity and I have been chomping at the bit to dine at the Ichikawa Buffet (as it were) to use his movies as a barometer and/or guide to some of these great literary works. In essence, I have been preparing to use Ichikawa like the "Classics Illustrated" comics from my childhood. They always promoted the notion of "now you've read the comic, read the full length book" and for me, that used to work wonders. I mean, really! What the hell! I'm technically not a kid anymore, but even adults with a bit of book learnin' can use some help now and again. The second reason I wanted to love The Makioka Sisters is that the first half hour is utterly spellbinding. 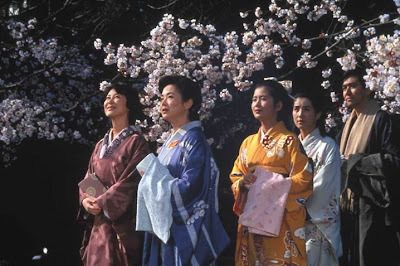 Though we focus only on the four sisters of the title (Keiko Kishi, Yoshiko Kasuma, Sayuri Yoshinaga, Yuko Kotegawa) and one husband (Juzo Itami, eventually a noted Japanese director in his own right), Ichikawa lays out an extremely complex backstory that forces us (not distractingly) to work overtime sorting out and digesting the relationships between the characters and the cultural/historical backdrop. Add to the above, one of the most heart achingly beautiful visual set pieces imaginable - the sisters taking a lazy stroll to enjoy the cherry blossoms - and you feel like you're diving into what might be a life-changing masterwork (save for the intrusion of one execrable element I will mention much later in this piece). The final reason I wanted to love this movie is that it's one of those potentially great Chekhovian stories I'm a sucker for - people looking desperately to make connections with each other (or ANYONE) against a major cusp period where it's easier to remain rooted in what's dying or dead than move forward and embrace or accept the new. It's a world where the ghosts of the past - replete with all their sins and triumphs - want to be at peace, but the living will not let them go, much to the detriment of all concerned. Within this social/cultural/historical cusp period, some will make it, most will not - and out of this shift in the divide should come both tragedy and comedy - all the stuff of great drama. Alas, The Makioka Sisters falls short of its goals. It is not even especially GOOD drama, let alone being great. Its story is a simple one - as most great stories are. Four sisters in pre-war (1938) Osaka live a life of relative luxury. Buoyed as they are by the inheritance left to them by their late parents, all should be well. It isn't. Tradition dictates that the sisters marry in descending order of their age in order to qualify for their share of the loot - which is, essentially to be their dowries. This is all well and good for the two eldest sisters who are already hitched, but the third eldest is a major wallflower and the youngest is clearly a modern lass with a burning desire to get on with her life. Tradition is holding her back, And ultimately, for the family as a whole to move "forward", marriage (and by extension, tradition) is seen as the only option - hence the central goal of the story being the marrying off of daughters three and four. Romance would be nice in the equation, but clearly low on the totem pole of what's seen as necessary for the preservation of the family. The needs of the individual are less than an afterthought. In fact, they're negligible. What keeps the movie from soaring, even though it occasionally feels like it wants to, is Ichikawa's approach to rendering the narrative. He often hangs back in medium wide shots and lets long conversations play themselves out. God knows I'm happy to watch bearded warriors in lotus positions in Kurosawa pictures as they discuss WHY they're at war and HOW they will do battle. I'm especially happy to sit for hours on end while people talk to each other in tatami-level shots in Ozu. Their pictures are replete with emotion and narrative drive - unlike The Makioka Sisters. For several reasons, Ichikawa's approach just doesn't cut it. Some will argue that his method is restraint - that he's avoiding the obvious pitfalls and clichés inherent in goosing every dramatic beat to the max. On the other hand, it could almost be argued that he's either lazy, incompetent or hampered by exigencies of production. Almost every single time he moves from his favourite (and I'd suggest rather dull) fixed camera position, so many of the cuts feel jarring and awkward (and not intentionally) while the variation of shots often seem to be from the wrong angle. Well, given the number of stunning set pieces in the movie, he's neither lazy nor incompetent, but I do think he was wrong to tell this story the way he chose to tell it. This is a story that, while simple on the surface, is loaded with layer upon layer of complexity and yet, one is hardly compelled to even bother peeling back those layers as the director seems so disinterested in wrenching our guts for fear, I suspect, of being melodramatic. Well, this is a bit of a problem when the story has all the hallmarks of great melodrama and none of the required execution. Ichikawa goes out of his way to mute every major melodramatic beat to the point where a handful of scenes compel you in a certain direction, then refuse to deliver up the goods. The movie has five major emotional set pieces (you'll discover those on your own) and they're exquisitely rendered on both visual levels and from the great cast (who are often wasted by Ichikawa's overall mise-en-scene). Sorry, Kon. This is really annoying, bud. You need to loosen up a bit. Ozu, for example, is able to wrench out drama from the smallest details and he is NEVER afraid of emotion. Some have suggested his approach is indeed restrained in order for the emotional core to open up and be real. I disagree. Ozu, like Kurosawa, is NOT afraid of being sentimental or even melodramatic. They are storytellers - first and foremost - and will use every trick up their sleeve to wrench emotion from an audience. As well, I'm not suggesting a measured, mannered approach can't work. It can. It just doesn't work in The Makioka Sisters due, at least based on this picture to Ichikawa either unwilling or incapable of achieving the heights his colleagues aimed for or worse, his inability to properly execute his own approach. On a surface level, the movie's concluding moments come close to creating that heart breaking devastation that's as sad as it is soaring, but by then, it's too late. Ichikawa has spent most of the movie muting all the emotion, occasionally and sloppily tossing in a dollop of it here and there, then allowing it to all hang out at the end. Great melodrama (or even straight-up drama) needs to build to such an explosion. Ichikawa seems so obsessed with his snobby attempts at restraint that he forgot he had an audience he needed to please. I've thus far avoided any background on exigencies of production that might have lead to Ichikawa creating this supremely flawed work (wildly praised from people who really should know better). The above were my impressions knowing nothing about the making of the film (my preferred method of seeing anything for the first time). That said, upon discovering that Ichikawa was commissioned by Japan's Toho Company to make the feature as part of its 50th year celebrations and that he was subsequently and idiotically nickelled and dimed to death, is still not reason enough to change my mind. In fact, I watched the movie a second time and my conclusions stand - it's a movie with occasional beauty, tons of potential but finally, a mess. The most bafflingly egregious element of The Makioka Sisters is the music. In spite of the fact that the movie was made in the '80s where the style of music chosen was popular for the RIGHT movies, it is completely, utterly and overwhelmingly incomprehensible to me why a movie that DEMANDED a full orchestral score is miserably fouled with synthesized music so god-awful it might as well have been crapped out by Harold Faltermeyer. The problem with this is that The Makioka Sisters is not about a Detroit cop in Beverly Hills. Given the score, it might as well have been. "The Makioka Sisters" has been lovingly restored and presented on a nice looking, but extras-lacking Criterion Collection Blu-ray.